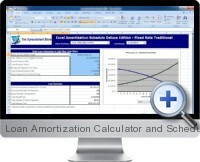 The Excel Loan Amortization Calculator and Schedule is a collection of templates for creating and calculating loan schedules under specific payment terms and contractual structures. Six fixed interest security types are supported with interest only, traditional interest and principal payments and balloon payment models. A loan summary analysis calculates and reports recurring payment amounts, the number of payments, payoff date with totals for the interest paid and extra payments over the loan duration. The loan amortization schedules are automatically generated displaying the dates an amounts of both interest and principal payments with accompanying charts. Saves time and resources by using accurate and professional templates for load schedule analysis. Eliminates errors with tested and robust loan payment calculations embedded within each summary report and schedule. Flexibility for a variety of loan structures allows the loan amortization calculator to be used as an extensible solution with the ability to compare alternative loan structures. Dynamic scheduling allows the analysis for large and complex loans with up to a thousand payment periods. Extra unscheduled payments can be optionally entered at every payment period to model uneven and variable repayment scenarios. Charting visualization allows to easily understand and report the trends of both principal and interest payments over time. Key statistics calculated within the loan summary reports gives and quick overview of the loan structure and obligation dynamics. Multiple date and currency format options can be selected from drop down menus for fast customization of loan reports. Loan calculation and scheduling is easy to use and understand with professionally designed reports suitable for publishing and distribution.